What is an Aesopian fable in the Renaissance? 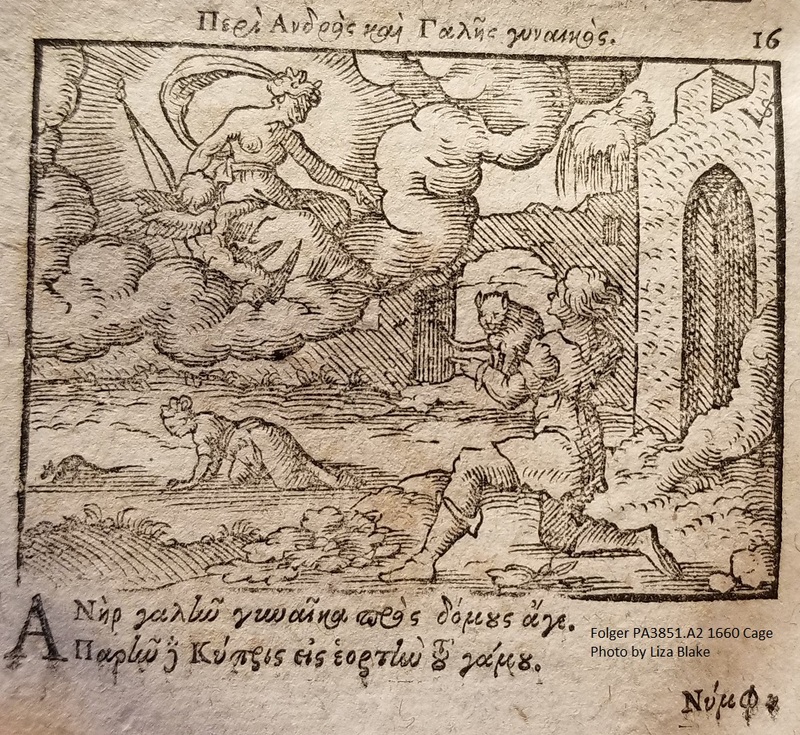 This post is about where our modern Aesopian fables come from, drawing on the Folger Shakespeare Library’s incredibly rich collections of animal fables. For more detail and proper notes, I recommend the recently published volume Arthur Golding’s A Moral Fabletalk and Other Renaissance Fable Translations, which I co-edited with Kathryn Vomero Santos—a copy of which is also held at the Folger. 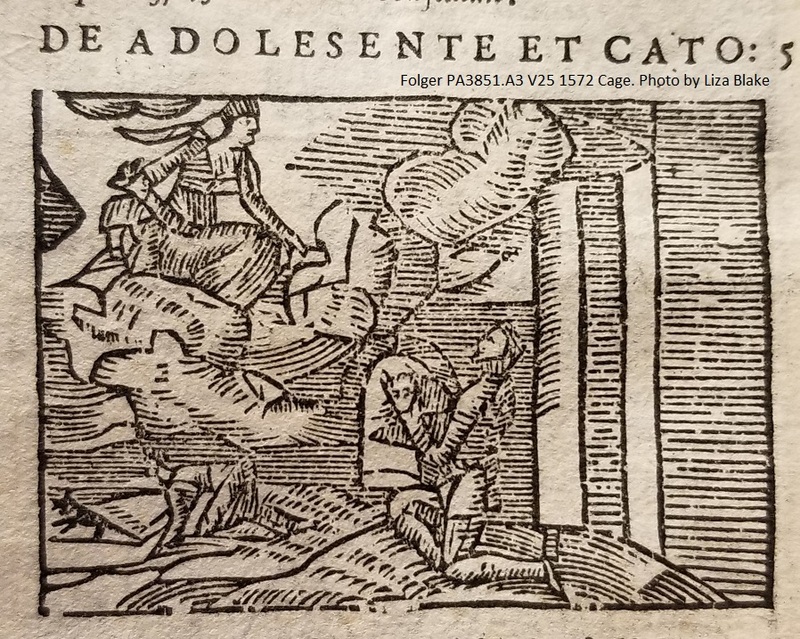 Let me begin, appropriately enough, by telling a fable: the fable of the Renaissance catwoman, or “Of the Youngman and the Cat,” as it is called in John Ogilby’s The Fables of Aesop (London, 1651). The illustration corresponding to Ogilby’s fable appears directly below. I give a much-abbreviated paraphrase below; read my and Santos’s edition of Ogilby’s long and elaborate poetic translation of the fable here. 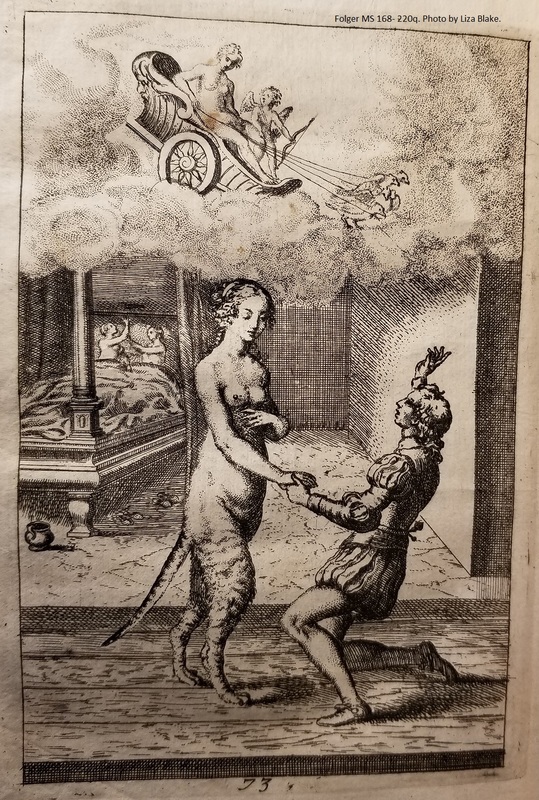 The transformation of a cat into a woman (halfway through, so she is woman on top and cat on the bottom), with Venus in her chariot above, and the couple in their marriage bed in the background. From John Ogilby, Fables of Aesop (London, 1651); 168-220q. One upon a time, there was a guy who really liked his cat—really liked her. So much so, that he prays to Venus, the goddess of love, to transform her from a cat into a woman he could marry. Venus grants his prayer, the couple marries, and as they are in their marriage bed Venus decides to test whether her transformation was complete. She sends a mouse running across the room, and the woman leaps out of bed, chasing it; Venus, upset that the woman transformed in body but not mind, changes her back into a cat. The moral of this fable? Some people never change. Where did this fable come from? Chart of fable families in the sixteenth and seventeenth centuries, zoomed out to spot large patterns. Chart by Liza Blake. In the process of trying trace our English authors’ fable sources, I compiled a massive chart (in Excel) tracking which fables appear in which Renaissance books. 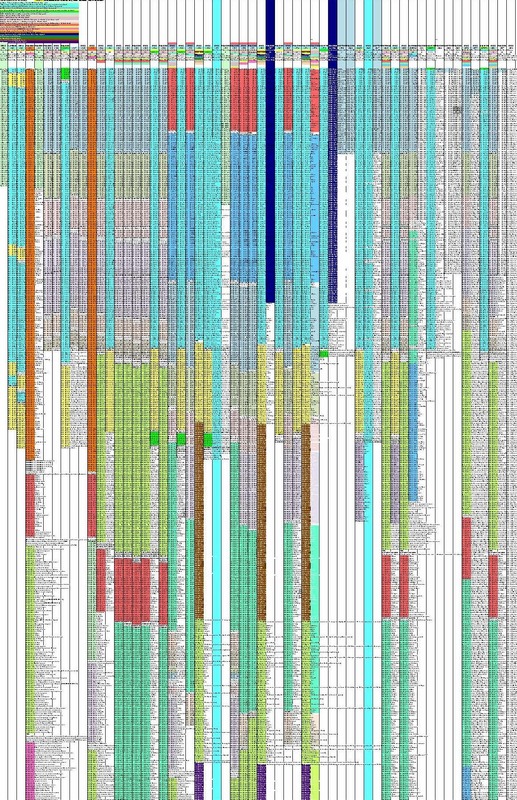 The image above is of a very zoomed-out vision of the chart, showing bands of colors representing coherent groups of fables in different books. 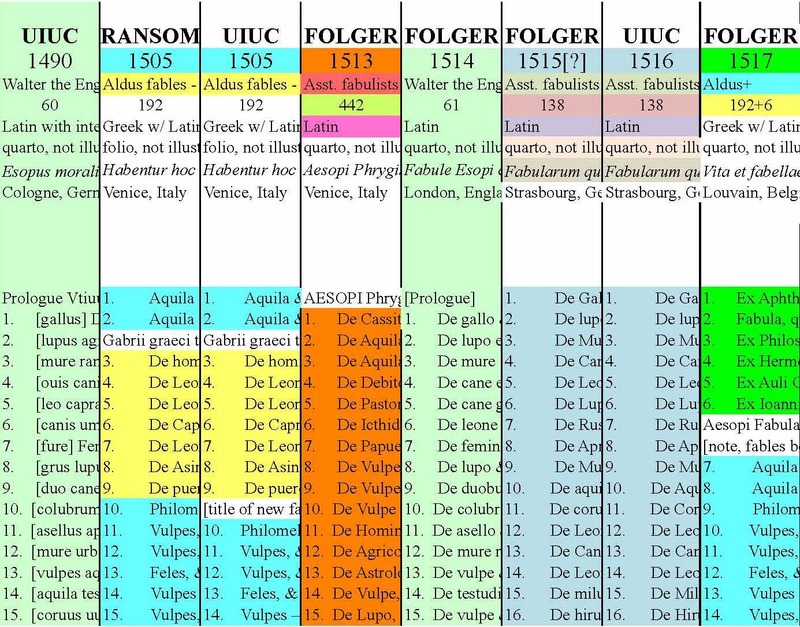 This chart is an attempt both to list the fables contained in each edition and to visualize the way different groups of fables get combined and recombined in different editions in the sixteenth and seventeenth centuries. 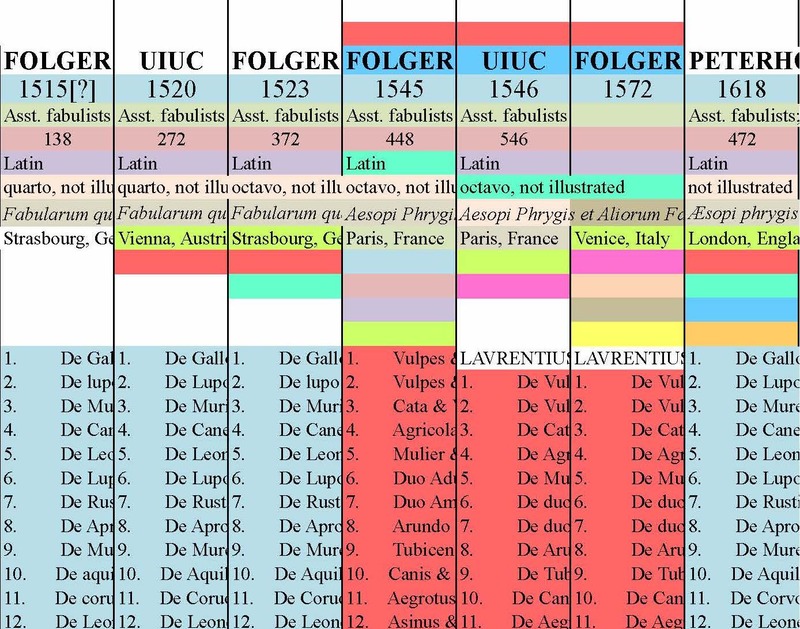 In the chart, each column is topped by the date of a given edition; under it I list the source of the volume, if known, the number of fables contained in the volume, the language of the fables, the format of the book (folio, quarto, etc. ), whether it has illustrations, and full bibliographical information. Under that I have added the city of publication, if it was listed.2 I then list the fables to be found in the edition and color-code matching groups across editions. For ease of reference, I show the bands of color that appear in the list below at the top of each column. At the top left is a key of each of the colors used, and what fables they represent (if the fables are attributed). If you would like to explore the chart in greater detail, you can download a copy here. What I found once I had compiled this spreadsheet was as follows: while the main groups of medieval fables in the medieval period were the fables of Avianus and the fables of “Walter the Englishman” (also called the elegiac Romulus fables),3 the Renaissance encountered a much more diverse fable tradition. Close-up of early part of the fables tracking chart. Chart by Liza Blake. 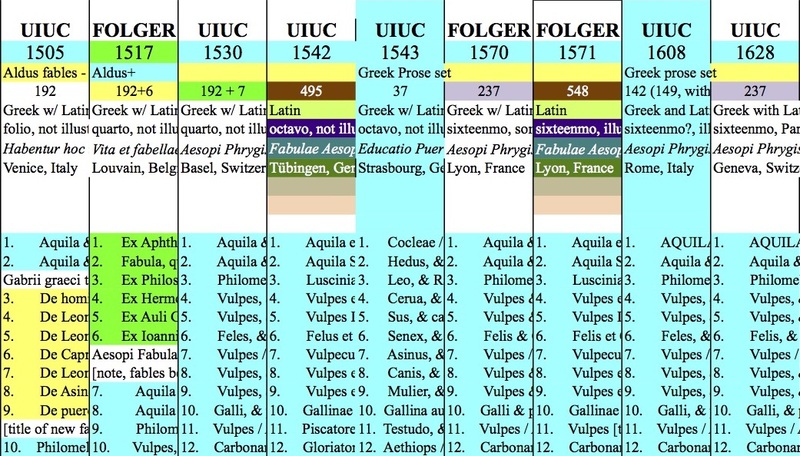 One can see from the early part of the chart above that Walter the Englishman (represented by mint green on the chart) survives, but he is joined in the sixteenth century by two other competing traditions: in 1505, Aldus Manutius, printer of many early classical texts in the original Greek and Latin, published Greek fables with Latin translations (bright teal and bright yellow); and in the 1510s, Martinus Dorpius published a translation of Latin fable translations by famous early humanists (pale blue, green, red, purple, orange, and gold). Because each of these collections represents not unique fables, but unique translations, there is often overlap and repetitions within editions. These branches start getting recombined, and supplemented, in later editions; so looking at the Dorpius grouping of 1515 (pale colors on the chart), for example, we can see it get reprinted in the 1510s, and then get supplemented in 1520 by the fables of Laurentius Abstemius (lime green and red), and again in the 1520s and 1530s by the fables of Rimicum (sea green). Excerpt of relevant columns showing Dorpius collections in different combinations. Chart by Liza Blake. The set can also be seen being recombined in multiple different ways in the entries from the 1530s–1550s, before settling, in the seventeenth century, into a more stable pattern. Part of this stability comes from the fact that the printing of Latin fables moves from European printers to the English Stationer’s Company in 1614, where the Dorpius fables, with Abstemius and Rimicum, are joined by some excerpts from the Facetiae (a jestbook) of the Italian author Poggio.4 This English collection of Latin fables went through at least 35 printings from 1614 until the end of the century. Likewise, tracking the fate of the Aldus edition of Babrius fables (the bright blue and yellow on the chart) also reveals a pattern of repetition with a difference. Excerpt of relevant columns showing Babrius fables in different combinations. Chart by Liza Blake. These fables are reprinted as a coherent set through the 1530s, though they are sometimes supplemented by 6–7 additional fables (lime green), and sometimes are joined by the Guielmo Hermano fables (pale purple) from the Dorpius collection. Beginning as early as 1542, the Babrius fables are also the basis of a new traveling set of fables, which includes some fables from the first Hecamythion of Abstemius (a light green on the chart), but also others whose sources I have not yet identified. This new set is supplemented again in 1564 and 1571 by two small sets of fables found in the Dorpius collection. At this point you may be asking yourself, what does this have to do with the catwoman? In addition to being useful for spotting patterns, the chart also is designed to serve as an opportunity to allow people to find early versions of fables, and possible sources for translators. Say, for instance, that you were interested in knowing the pre-history of the Renaissance catwoman. It takes some searching, and a bit of Latin, but reading through lists or keyword searching the chart tells us a surprising lesson: the fable of the catwoman is ubiquitous in the Renaissance and existed in at least five different Latin translations (and several English translations) in the period. Where Ogilby’s fable of the catwoman comes from is, it turns out: everywhere! and an anonymous source’s ~214 fables (dark orange) as “De Fele/Cata in Foemina mutata” [Of the cat transformed into a woman]. Because these fable collections get added to one another, there may be many versions of the same fable even in one volume; the Folger 1572 collection, Aesopi Phrygis et aliorum fabulae, has no fewer than four versions of the catwoman fable (in order, in translations by Vellensis, Barlando, Rimicus, and the Latin Babrius). Further, it turns out that the fable of the catwoman, known to classical scholars as the fable of the weasel bride, is one of the oldest fables there is. Ben Edwin Perry, major scholar of fables, developed a classification system in which he assigned every basic fable narrative a number to track them across translations; this number is referred to as a fable’s Perry number, and the fable of the Weasel Bride is Perry 50.5 It is known as the fable of the weasel bride because the original Greek gives the word galē, translated into Latin as fele, both of which can mean either cat or weasel. But in the European and English traditions, it was clearly much easier to imagine a man falling in love with his cat than with a weasel. A man holding a cat, praying to Venus, from Barlow’s multi-lingual collection of fables (London, 1666); Folger A696. The cat is still a cat; in the background we see the woman, as a woman, leaping from her marriage bed to chase mice. If we know, then, roughly where Ogilby’s fable comes from, we might also ask the source of his dramatic illustration of the cat-woman in mid-transformation (engraved for Ogilby by Wenseslaus Hollar). The image directly above this paragraph is from a volume published in 1666 by Francis Barlow, which includes, for each fable, an image, a brief Latin version of the fable, a greatly expanded French prose translation, and a greatly condensed English poetic translation, engraved below the images. This collection was reprinted in 1687, when the English poetry by Thomas Philipott was replaced by that of female poet and playwright Aphra Behn, no doubt in an attempt to add a bit more star-power to the volume. The image, above like the Ogilby image with which this post began, shows their marriage bed in the background, and Venus above granting the prayer. But it lacks the most striking and central detail of Ogilby’s engraving: the catwoman mid-transformation. Is the man clutching his pet cat a modest substitution for Ogilby’s earlier catwoman? Tracking earlier iterations shows that, in fact, Barlow’s engraving is closer to the tradition of illustrating this fable. A man holding a cat, praying to Venus, from Fabvlae Variorvm Avctorvm (1660); Folger call number PA3851.A2 1660 Cage. The cat is still a cat; in the background we see the woman on the ground chasing a mouse. 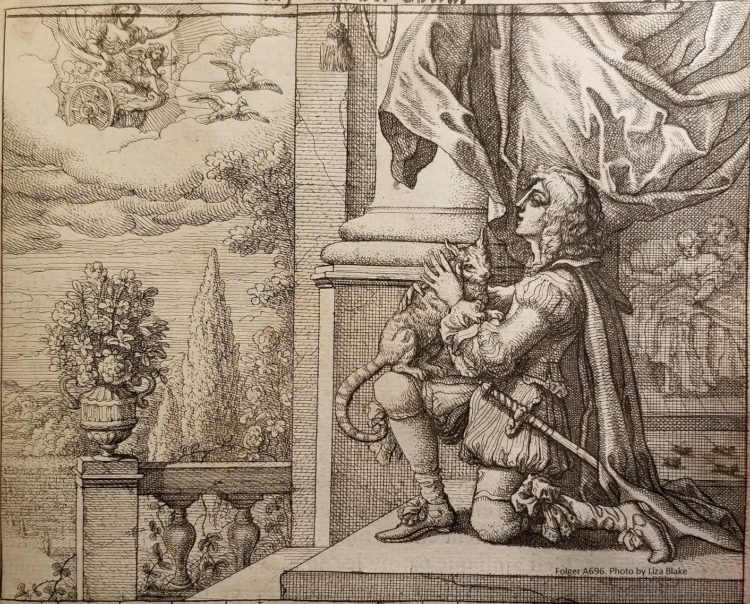 A man holding a cat, praying to Venus, from Aesopi Phrygis et aliorum Faulae (Venetiis, 1572); Folger PA3851.A3 V25 1572 Cage. The cat is still a cat; in the background we see the woman on the ground chasing a mouse. Here the cat’s face is left carefully blank, and we see the man has her by the throat—perhaps we might read her as slightly less enthusiastic about the man’s prayer in this illustrator’s vision of the fable? The history of Aesop’s fables before they became children’s literature is a rich, and complicated one, as I hope this post has shown—people interested in source studies and tracing the origins of narratives can follow rich and complicated lines of influence, both textual and visual. The study of Aesopian narratives also has fascinating complications for translation studies—what does it mean to study an “author” for whom there is no original, only multiple, sometimes conflicting translations? With the Folger Shakespeare Library’s exhaustive collection of Aesopian texts, there is almost no better library to answer these questions and others. This is still the case today: while the Loeb Classical Library has rigorously established texts for many classical authors, there is no Aesop Loeb, only a volume of fables by Babrius and Phaedrus, two of his earliest translators: Babrius and Phaedrus: Fables, trans. Ben Edwin Perry (Cambridge, MA: Harvard University Press, 1965). For more on Aesop as a swarm see Blake and Santos, Renaissance Fable translations, 10–12. On medieval fables see Seth Lehrer, Children’s Literature: A Reader’s History from Aesop to Harry Potter (Chicago: University of Chicago Press, 2008), p. 43. This text is typically entitled Aesopi Phrygis Fabulae, and is cited by Roger L’Estrange as the standard textbook of fables in his Fables of Aesop and other Eminent Mythologists: with Morals and Reflections (London, 1692), sig. B1v. This can also be found in the Loeb Babrius and Phaedrus volume, Babrius fable #32.